The Ebola pandemic presents a pretty good argument that preparing for outbreaks of infectious disease is more successful and less expensive than waiting until something happens. During the Ebola epidemic in West Africa in 2014-15, more than 11,000 people died, according to the World Health Organization. The pandemic cost the regional economy $2.2 billion, and the international community spent another $1.6 billion on response efforts, reports the World Bank. Fast forward to right now: world health experts are predicting that the current Zika virus outbreak, which is suspected of being linked to severe birth defects in the Americas, could pose a bigger global health threat than Ebola. In response to the Ebola crisis, the National Academy of Medicine convened a commission to figure out how to prepare for the next threat. That panel’s report, released on January 13, concluded that an annual $4.5 billion investment to improve public health in low- and middle-income countries would save an estimated $60 billion per year in economic losses, not to mention countless lives. The cost: about 60 cents per person. Along those same lines, Tufts is a lead player in an international partnership of universities that is training future health-care professionals to respond to, and ultimately prevent, infectious diseases transmitted between animals and people. Researchers from Cummings School and the University of Minnesota are heading up the One Health Workforce, a five-year, $50 million initiative to ensure that universities in East and Central Africa and South East Asia are offering the courses and training so that health-care workers can address pandemics from myriad perspectives. The One Health Workforce project is part of the U.S. Agency for International Development’s Emerging Pandemic Threats program; the notion behind One Health is that the well-being of people, domestic and wild animals and ecosystems are interdependent. For the One Health project, Nutter and other Tufts faculty members are serving as technical advisors to help “train the trainers” in more than a dozen countries that are hot spots for emerging infectious disease. “We’re focused on education to prepare the workforce,” says Nutter, who is partnering with university educators in Indonesia, Malaysia, Thailand and Vietnam. A significant component of a One Health approach is understanding how cultural norms may contribute to the spread of disease, such as families engaging in pre-burial washing of a loved one when the body is still contaminated, as was the case with Ebola, says Janetrix Hellen Amuguni, V11, an assistant professor of infectious disease and global health. 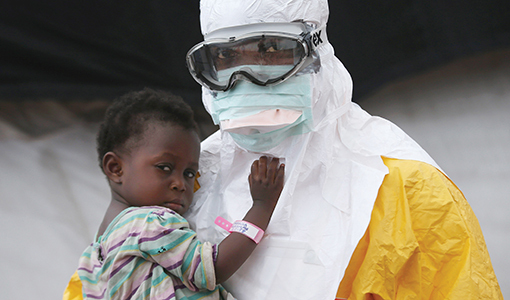 As a result of the advance planning, the Ebola outbreak in Uganda was contained in 26 days. Every country has different needs. Kenya, for example, has a well-established veterinary school that can host emergency-response simulation events, whereas the veterinary school in the Democratic Republic of Congo needs basics, such as computers and laboratories. While Amuguni and others say it will likely be decades before the results of their work will fully bear fruit, the recent Ebola epidemic in West Africa shows they’re on the right track. During an earlier Ebola outbreak in Uganda, “it took them a very long time to respond,” Amuguni says. In the aftermath, the USAID worked with government officials to put together an emergency response team and plan for future disease threats. Contact Genevieve Rajewski at genevieve.rajewski@tufts.edu.